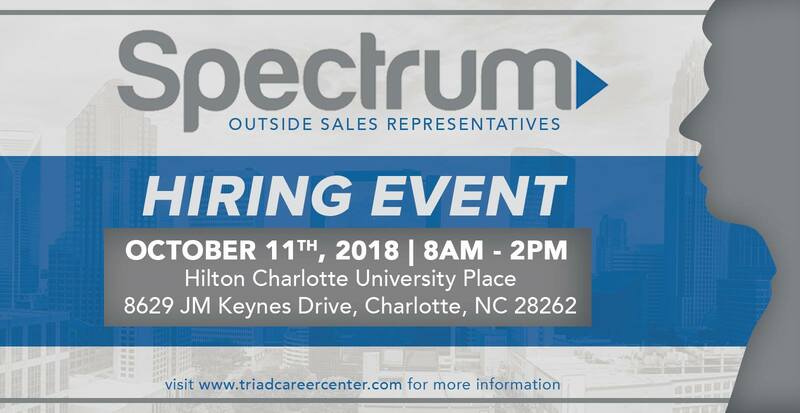 Charlotte, NC- The Career Center of the Triad has sponsored a free hiring event on Thursday, October 10th, from 8:00 AM. to 2:00 P.M.at Hilton Garden University Place, 8629 J M Keynes Dr, Charlotte, NC 28262. Combined, Spectrum has dozens of Sales Positions. No Experience Required! The event and parking are free to the public and will provide opportunities for job seekers to submit resumes and talk with hiring managers. Job seekers are encouraged to apply online prior to attending the event. The purpose of this event is to provide resources for people looking for employment. This will be the 54th event the Career Center has held in the past 12 months. We have helped place over 400 job seekers back to work.